Galvatec is a manufacturer for the steel building construction industry, offering high quality products and reliable service. We can proudly say that our materials are made in the USA. • Our Galvalume roofs have a high heat reflectivity which helps save money on energy and meet EPA Energy Star Standards. • We use Galvanized Secondary Framing that does not require to be sealed or painted, prevents rust and it has a long life. • We use 1” wide mastic tape to ensure the best leak prevention. The industry standard is ½”. • We also include the complete base trim to save our customers time and money on labor and cement for framing sheeting notch in concrete that won’t be necessary anymore. • We don’t use bare primer so there’s no need for paint like red-iron packages. All our secondary framing is galvanized for greater rust protection it includes door frames, base angle, purlins, end columns, girts, and more. • I-beams are included. On the primary I-beam columns we use quality coating, it dries quickly, it protects against rust, it’s water based, chromate free and lead free which is far superior than other low durability coatings. • Innovative Silicone-Polyester color wall-sheeting with a 40-Year Film Guarantee is included on walls. • We offer long life lasting Stainless-Steel Fasteners for roofs and walls, which offers more protection for rust than zinc fasteners. 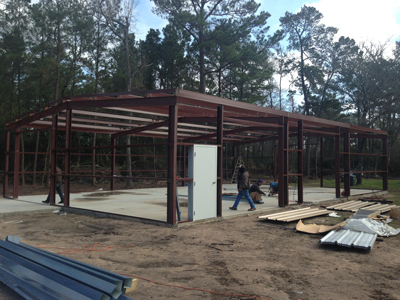 • Our first frame start at 3.5’ from ground for added sheeting protection. Note that other companies start at 7’ up from ground offering little wall protection. Our low girt also provides convenience for drywall installation if needed. • Main components are marked using laser technology for easier identification of parts, which aids in a faster assembly. • Extra wind strength is provided with our Tension Cable X-bracing package. • Clearspan design offers more usable space because it doesn’t need low beams or columns. 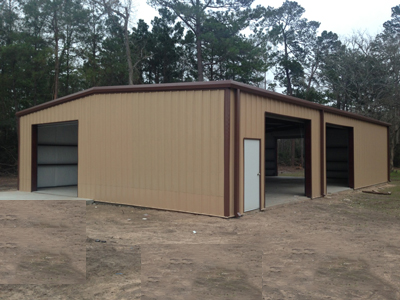 • The building includes Premium sealant and closures. If you have any questions, please don’t hesitate to contact us. We look forward to helping you with your building project.